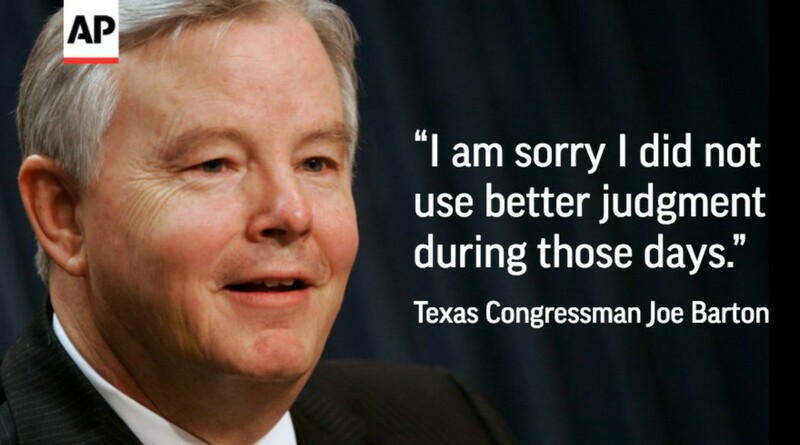 For the better part of a decade I've been trying to get rid of Congressman Joe Barton. #1 like so many others he's been in Congress way too long. I've always pointed out how hard it is to get rid of an incumbent who has name recognition and money. Joe Barton would let you know it openly. It's a math problem they made happen. For years I've been saying the only way we get rid of them is when they are carried out in a box, find out they've touched they wrong person (man women or children) or expose themselves on the internet "Hello Joe" it's time to go!. Joe's first move is to admit of his foolishness and apologize. It's amazing Joe's supporters claim he's a victim and now runs to the Capital Police for cover. Democrats have been circling the wagons around their pedophiles, misfits and outright thieves for decades, can you say cigar smokin Bill Clinton? ​Now we see the people we've elected are not so smart, they are arrogant, full of themselves and not what they claim to be. Politicians, Hollywood actor directors, CEO's, people with money and power are falling like flies. Some have been fired, but many will try to hang on to the bitter end by apologizing, claiming they are a victim, going to rehab, while colleges will attempt to circle the wagons and save he or she no matter what they have done. Now we find out the politicians had a secret fund designed to pay off sexual harassment cases against them for at least a decade. It's been used over 235 times and over 15 million in payouts according to reports. It makes us wonder just what kind of other secret funds exist? ​We should feel like fools for re-electing these people decade after decade. They've literally built themselves empires where everything is in their favor, it's time for a swamp draining and what better time than now? It's time for Joe To Go, he's a victim alright a victim of his own stupidity and that's what the Capital police should report. ​Let me see, I have till Dec 11th to put my name on the ballot, I can surely do a better job of working for the people and being honest..
Morons ALL Let Us Know Who your local moron please..